What I like about homemade pizzas is that they are equally tasty as those from Italian restaurants. Best of all, you can choose whatever toppings and add as much as you like. The first and utmost thing is to make the pizza base. Then the following steps are straight forward, just sprinkle your favourite toppings, pop it in an oven, wait for 5 to 10 minutes, the whole family can enjoy a delicious pizza fresh from the oven. In a mixing bowl, combine the lukewarm water and sugar until sugar dissolved. Mix in the yeast and leave it in a warm place for 5 to 10 minutes, or until frothy. Stir in the olive oil. In a large bowl, sift in the bread flour and salt. 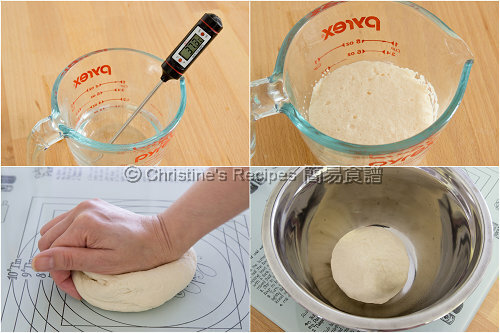 Pour the yeast mixture over the dry ingredients and form a dough. Turn the dough out onto a clean work surface and knead the dough until smooth and elastic, about 5 to 10 minutes. Roll into a ball shape. Place in a lightly greased bowl, cover with a plastic wrap or tea towel and leave in a warm place to prove for 45 to 60 minutes, or until doubled in size. Lightly dust a clean work surface with the extra flour and take the dough out. Use your fist to knock the dough back to let the air out. Cut the dough into two equal portions. Roll each into a ball shape. 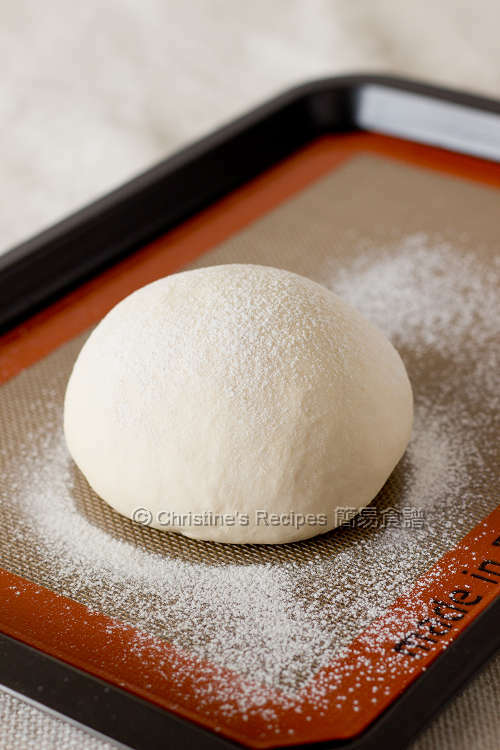 Place the dough balls on a lined baking tray, cover and leave in a warm for about 15 minutes. Roll each portion into a 20cm-diameter disc. Follow the instructions of referred recipe to make pizzas. The sugar water shouldn’t be over 40C / 105F, otherwise the yeast will die. You can make the dough discs well ahead and wrap with plastic wrap separately. Store in freezer until you’re ready to make pizzas. 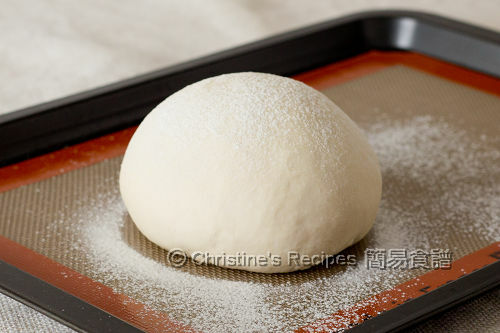 When you’re ready, just remove the dough disc from freezer and let it rest at room temperature for about 15 to 20 minutes until soft. Sprinkle toppings and pop it into oven to bake as instructed in the referred recipe. hello, i enjoy reading your post :) i'm starting to cook for my 2kids n hubby now and looking for ezy n delicious recipes. The dough shouldn't be too sticky at all. Well, you might need to knead harder next time. But glad that your pizza turned out great. u have a lovely space Christine. keep rocking..great tips and wonderful recipes. Hi Christine, need to knead until window pane stage? For making pizza dough, you don't need to knead until it goes through window pane test. Just knead until it's not sticky. Thank you so much for this great recipe! My family loves it! Great blog keep up with the good work!! Christine, everything that made and did here are awesome!! Hi I like your recipe very much! Sorry, don't have the recipe you're after. how i wish i can get hold of your recipe book, i have been fascinated by your recipes. Can I knead the pizza dough using my bread maker dough function? Pizza dough don't take too long. Probably 10-minute kneading is enough. Can u plz tell me wats bread flour? Bread flour is a high protein flour, that contains about 12.5% to 13.5% of protein. Hi Christine, my name is Christine too. I tried your recipe(Hong Kong Sausage roll), it's really good. If the dough is kneaded enough and proofed enough, it shouldn't be hard in texture. I posted some pizza recipes on this blog. Simply follow the recipe to bake. Generally speaking, about 10 to 12 minutes at 200C, depending on how thick your pizza is.